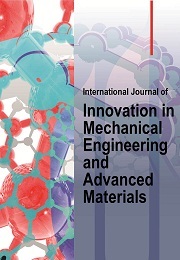 International Journal of Innovation in Mechanical Engineering and Advanced Materials (IJIMEAM) is a scientific open access journal which publishes theoretical and empirical peer-reviewed articles twice a year. IJIMEAM is available online (e-ISSN: 2477-541X) as well as in printed version (p-ISSN: 2477-5428). Contributions must promote the progress and understanding of phenomena related with all aspects in mechanical engineering and advanced materials.